I think some of your experience might be in bringing an army you're unfamiliar with to a tournament. It's often best to be very familiar with what you're playing, and what your opponents are playing. Iron Jaws got a boost in 2nd edition, as you can easily get +4 or more to charge distances with them, and you're a predominantly assault army. The boost shamans get too casting, is handy when trying to cast endless spells. Overlords too I think are strong as well. Their navagators are one of the best dispelling units in the game, and they have awesome shooting. They are a finesse army, and you really need to pick your targets well. Enginriggers and rifle thunders are both fantastic units, as well as geared out company. The -1 to hit characters can be a thing, but you have enough shooting, that killing a 5 wound buffing character shouldn't be an issue. If you ally in a wizard, the soulsnare shackles could be handy in tying folks down. Playing to the mission is critical, more so than in 40k. I really don't think you sound give up. I also am not a superstitious dice person. I find it's easy to not notice hot dice when it doesn't matter, and focus on poor dice when it does. Just keep at it, and try to learn from the games you loose. I 2nd KS. I have refused to play AoS until now. Haven't played yet but like the looks of 2nd. Plus I have my Nighthaunt now. Supposed to play soon but life keeps interfering. Keep at it, it'll pay off in the end plus your army looks way cool! If you are really rolling below average, try a new batch of standard GW dice. I think that there is something off about some of the dice GW manufacture. Mostly the ones with skulls carved into where the '1' should be. I just don't think they are very well balanced compared to other dice like chessex (which is what I use). GW dice do look great, but I try to avoid any of them that have the skulls carved into the '1', call me superstitious lol . I have two sets of GW Maelstrom Dice and 3 sets of chessex dice. The chessex dice seem more balanced on average when I try to compare them, but keep in mind I'm no dice master... Just eye-balling it on occasion . Yeah funcky GW dice have balancing issues, some of them have straight up defects like the blood angels dice were bubbled (multiple sets), we have noticed standard GW dice tend to be OK.
Watch out for chessex dice, some sets have a bias (can be to either end), it got so bad they have been banned from my local group. Ah , did not know that about the chessex dice. Maybe I'll look at some of the GW ones again then... Hmm, maybe the Idoneth and Daughters of Khaine dice aren't so bad? Definitely not saying that all GW dice are funky, but the one's that are noticeable are pretty noticeable. Haven't heard much about the Stormcast Dice, but the one review I've seen on the Nighthaunt dice aren't very positive . @Calamity: Just curious, but can you share with us the Ironjawz list that you are using? I've actually scribbled down a few quick lists with them, just out of curiosity cause I think they're cool. Maybe some of us can give you a little advice on how to amp that list up ? Apologies for my last post guys. Just venting, because it's so frustrating. Funnily enough, my last game against rotbringers was much more to my liking. Lasted 5 turns, came down to the wire and I put the hurt on my opponent too. Only narrowly lost. I can stomach this sort of game. I wish they happened more often. You're not alone. I'm taking a break from 40k myself although we'll be playing some Kill team as soon as our books show up. I keep failing required psychic tests and charges around 5-6". Not to mention all the Dark Eldar lists with 12+ command points countering my required stratagems I need to make certain things work (and then regenerating some back with the right warlord). I haven't gone first in about 20 games. A lot of which includes my opponent seizing the initiative. This is the biggest let down as I lose a few units and can't gain board control. On top of that the fun units and fluffy things aren't worth taking. Very frustrating. Take a break and come back to it. These are all serious issues with the game aren't they? I haven't played 40k in a while but I hear that this is one of its biggest problem at present; cp spam. It is frustrating to say the least. Yeah tourney players are a different breed, the game takes on a completely different feel when you find a group that focuses on fun rather than winning. Might be an idea to see if there is a narrative group in your area. I would love that. People who play for the game itself rather than winning. There was one guy in a previous tournament who was a bit salty with me right up until turn 3 when the game swung around to him again. Groaning and cursing under his breath whilst I tried to get through my shooting phases, and then declaring "right, my hero phase now" almost after I used every unit. And not as a joke too. I was smiling, but I wasn't really happy if you know what I mean. He eventually mortal wounded my Overlords off the board, and it was obvious he just wanted to get that over and done with. @Calamity, sorry to here about your rough experiences in these tournaments. I second mage that maybe some narrative or open play groups might be just the thing to kick some fun back into your games! I will admit, I am still learning the ropes with regards to Ironjawz. They're simple to play, but they do require everything to go well. I need good dice. This is half my problem. All your tactics mean nothing when everything fails to hit or go off and every save fails, even when it's 3+. Half the reason I play as Barak Thyrng is for the rerolls. That's how much I need them. I had to make 8 3+ saves for my Mawcrusha. I rolled 5 1s...and a 2. This of course gutted it. And this is typical too. 5 Brutes with 1 gore choppa. It's designed to get as much out of the running and charge bonuses they have as possible, with plenty of troops for objective taking. The Mawcrusha Boss is in for a lot of attention, hence the insurance placed on him. And the other one has the cloak to help him keep him up with the troops. It's a little bit fluff, little bit crunch. Hmm, I think the Ardboyz and the Gore Gruntas are probably the weak link in this list. From what I've tested, 10 Ardboyz isn't really enough for them to perform great. I like that they have 2 wounds and 4+ save which makes them tanky. Personally, I would try to take a configuration of like 20 for tar-pitting units, and have them all wielding Big Choppaz for that -1 Rend across the entire unit. You could drop the Ironskull's Boyz and the Ardboyz and add in more brutes instead, but I thought you still might want to use your Ardboyz . With the drop of the Gore Gruntas, War chanter, and Megaboss, you could fit in two allied Gargants, which in addition to your mega-boss on Maw-Crusha, will give your opponent much more huge threats to shoot at . Plus they are all pretty good damage dealers, and I think Gargants are a fun unit too! Also, that is a lot of points put into the battalions, is the extra charge threat more worth having another unit of Brutes / Ardboyz / Gore Gruntas / Gargant? Also, buy some new dice and burn your current ones for the heretics they are ! I've been mainly in the 40k sphere so I haven't heard about them yet, most games I've seen played have been with standard dice. For a competitive list, I'd highly discouraged Aleguzzler Gargants, they are pretty terrible lol. I think the strength of Iron Jaws, is bonuses to charge, and hordes of 'Ard boys. Cheap 2 wound models with 4+ saves are very good. Slam them out quick, bully your opponent into their deployment zone, and score all the objectives. If you can hold the majority of objectives for three turns, your opponent cannot win afterwards, doesn't matter what they do. Fair enough, good thing I never bought those Gargants . But you would agree that the Ardboyz could use more bodies on them? I think two units of brutes is a good number of them. I would reinforce the Ardboyz by dropping some HQs and the Gore Gruntaz. But that's just my opinion (Also the opinion of someone who has not played AoS yet!). Take it with a grain of salt! Hey guys, just a really quick update and a question. 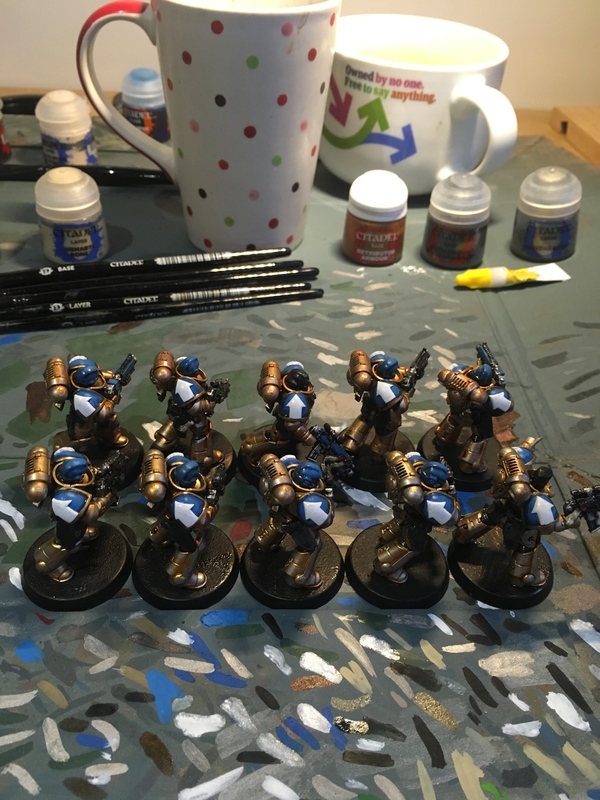 I took delivery of my ‘tactical arrows’ from Shapeways this weekend, meaning that my marines are finally going to get their other shoulder pad finished. I can’t wait to start them! But about their bases; I’ve decided to go for a grey ash wasteland effect that matches our usual board. With hindsight I should have used the sector something bases but I couldn’t afford them at the time and well, that’s that. What’s the best way to do this? 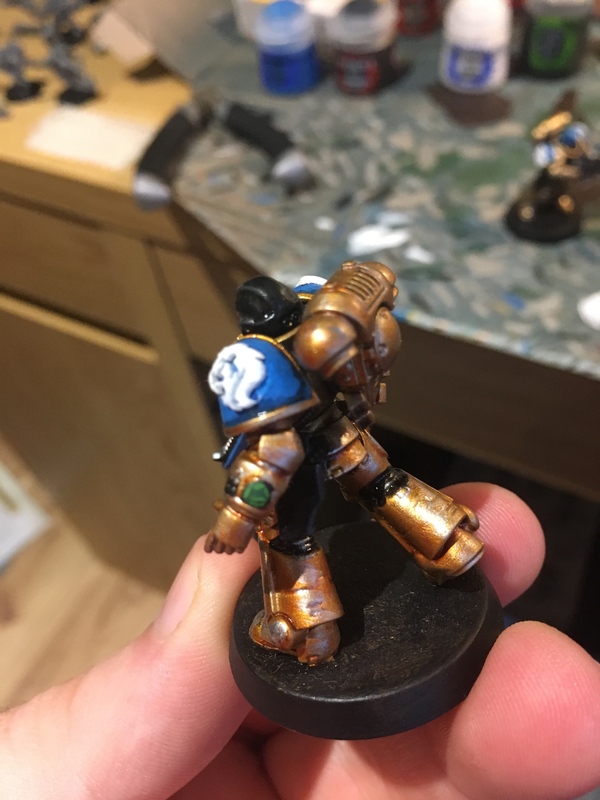 Sand, painted up? 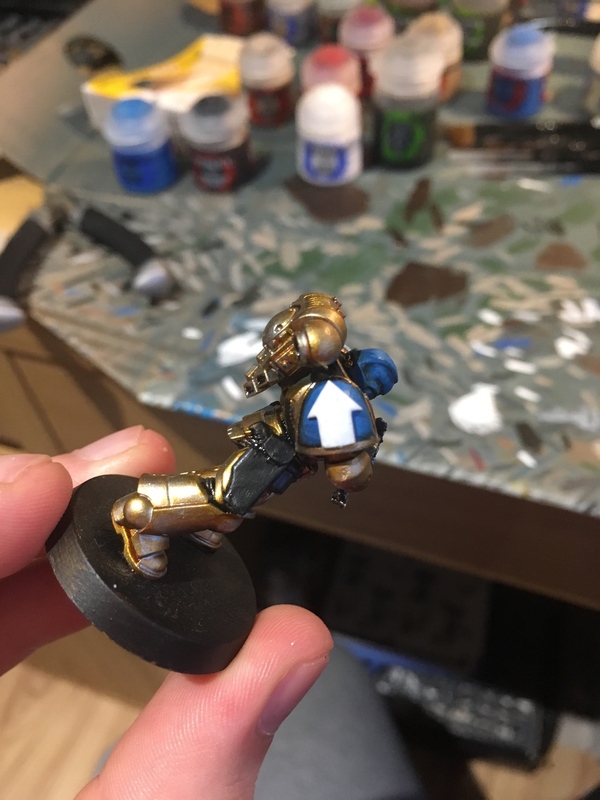 It’s been a very very long time since I did basing work. I do apologise for the lack of activity. It’s all down to work. But I plan to take some time off very soon to get caught up on everything mini related. Gale force 9 has a grey ash flock, I used it for more of a lunar lanscape for Warzone models, but you could certainly apply it like an snow covering. I think Cav outlined how he did his bases in his thread quite a while ago. It may take some searching, but I've always liked the aesthetic of his bases and they seem to match what you are trying to achieve. Otherwise, I'd probably consider GW's Astrogranite or Astrogranite Debris, follow it with a wash of Nuln Oil and then drysbrush it back up to pick out the highlights using something like Administratum Grey. Great suggestions guys, much obliged. But this is a bit pants and probably needs redone. But how’s the rest looking? Any good? 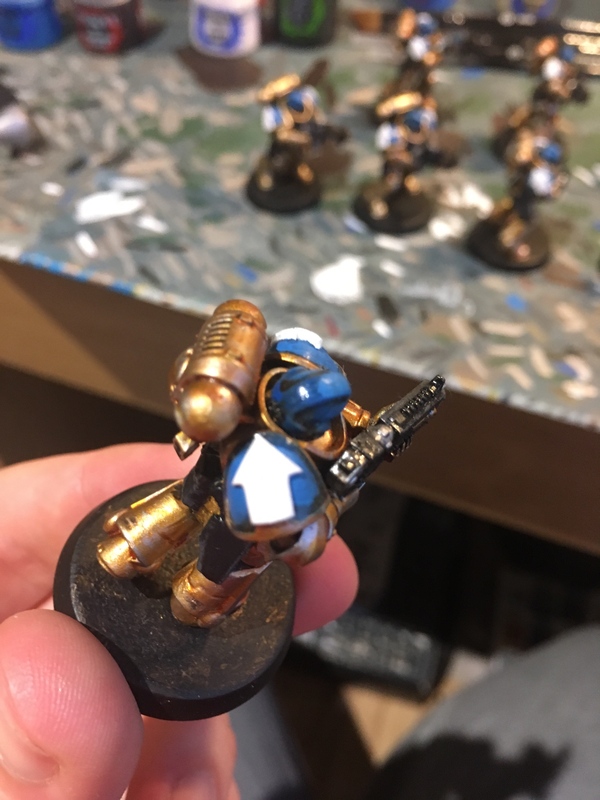 Now to just do the bases and paint the sergeant’s head. I need to check out how to paint dark flesh. They look great especially as a unit. The only minor thing is I think the items on the shoulder pads are too thick. Is that the arrow and the lions head icons? Yeah, when you get close it looks like the stick out past shoulder pad lip. Now this is a Marine Chapter I can approve of. Lots of gold and white lions = WIN!!! Great stuff Tangi. Really dig the paint jobs. The shoulder pads look great, so nothing to worry about there. Colors, paint jobs and now icongraphy are all together and looking great! 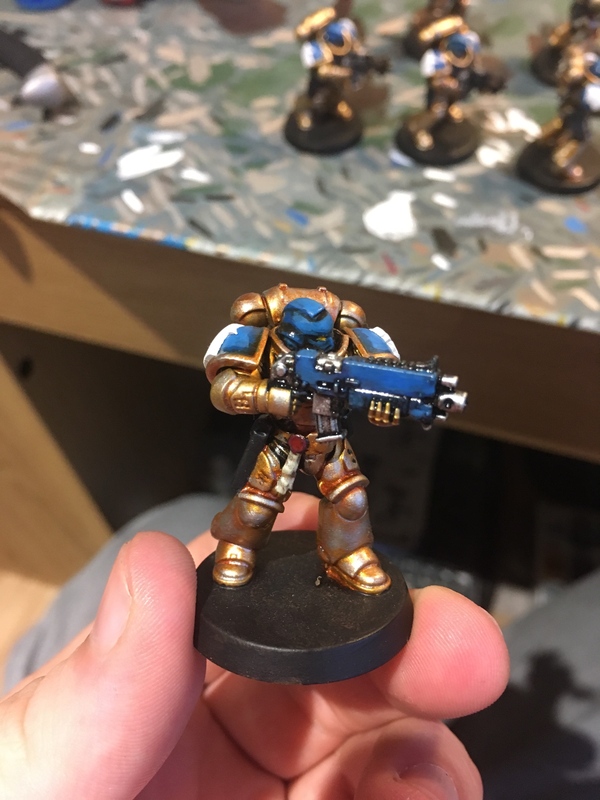 Can't wait to get Primaris stuff for my DA in the future. Keep it up bud this force is looking excellent! Great work Cap. Speaking of the lions/Tac symbols...I think that if you can only tell that the symbol comes out past the lip of the shoulder pad, then you don't have anything to worry about. It's barely noticeable. I love how strong the white colours are for the symbols too...they really pop. Great work Cap, I look forward to seeing how you go on to finish these models! Again I want to thank you guys for the words of support and encouragement. They’re really appreciated. Big announcement; I have finally gotten the basing materials I needed to start finishing models. And after only a year and a half to boot! The bases of the marines you will be expecting; urban debris. That’s grey gravelly rock, which should contrast well with the golden armour. The Overlords though, you might not have expected. After checking out the pictures of Chamon in the core rulebook, I have tentatively decided to go for...red. Bright, vivid red. Like the surface of mars. Because areas of Chamon are apparently like mars! 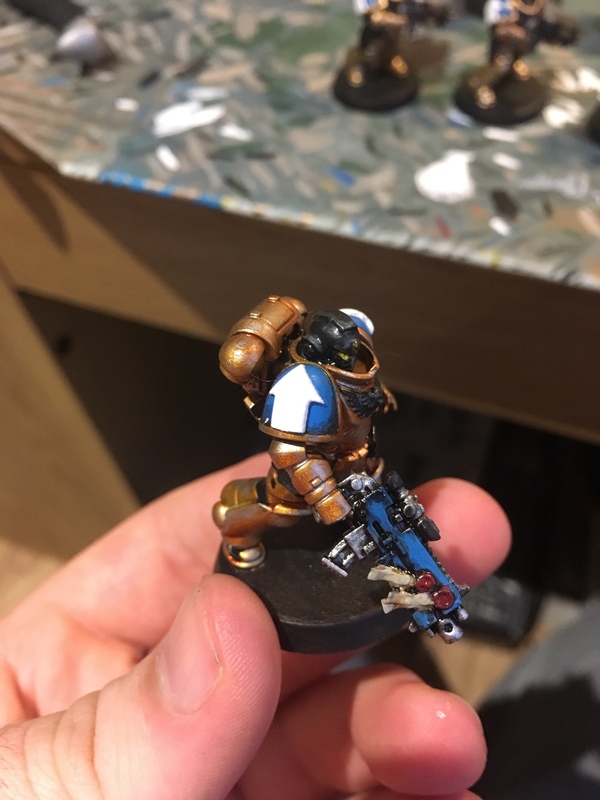 This red should contrast really well with the grey brass uniforms. However, I’m not sure how it will look with grey rocks (admiral, navigator) and blue crystals. Also, going off the citadel painting app, I got the ‘Martian Soil’ combo (Martian Ironcrust, Ryza Rust and Tyrant Skull) but I’m wondering if I should have stuck with the ‘Arid Martian Soil’ combo (Martian Ironearth and Khindleflame). The latter looks more ‘tame’ and ‘sci fi’, while the former does look quite fantastic, being proper red. Also, I haven’t forgotten the blue sand idea either. What I’ll probably do is a test base of each idea before committing. I’m hoping to start this week, but since I’m mad busy at the moment I’m not counting on it. Awesome news, Calamity, cannot wait to see these bases up and running. Also really like the shoulder pads for the Celestial Lions. They are a bit big, but I think it emphasizes the gothic flair that most Space Marines think are flashy in the 41st millennium .